This. Foundation. Is. Awesome. The End. Just kiddingggggggg - you didn't think I could avoid a chance to ramble on about a new found beauty product that is knocking my socks off, did you? You know me better than that. And trust me you want to know this foundation just as well. 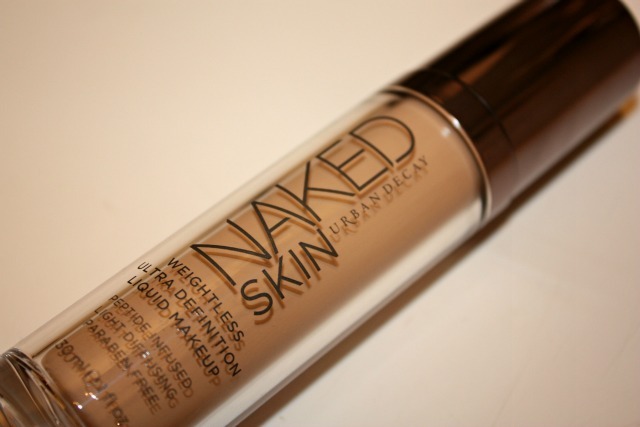 Known already for their smash hit the Naked Palette and Naked Palette 2, Urban Decay really hit it out of the park with this foundation. To have one product stand out in my plethora of beauty treats, amongst my already large makeup collection means one of two things - it is horribly bad or amazingly good. Since I believe in focusing on the positive and products I love for this blog, naturally it is the latter. Now that I have sufficiently gushed, let's get to the review. As many of my readers already know, I have extremely oily skin that never seems to have a day where the shine is not glowing. Skincare plight aside, I have unfortunately set my standards low when it comes to foundation and resigned myself to applying powder all day, every day. I just want it not to make the situation worse. So finding a foundation that doesn't contribute to the shine and actually stops it completely and ALL DAY seemed like a dream. A naked dream. But dreams do come true, ya'll. They not only come true, but they make your face look like a flawless porcelain doll. Being a former makeup artist (oh you didn't know? well....I don't like to brag..:) ), I believe in applying foundation with a brush, typically a natural hair flat top brush like this Real Techniques Buffing Brush. One of my faves, too. Starting in the center of the face and working out, I buff the foundation into my skin. The texture is perfect, and is highly pigmented so it provides amazing lightweight coverage. Only a smidgen (not to be confused with a pinch) to cover most of your face. The finish is a velvety natural matte, keeping the shine at bay but still giving an all over radiant glow. How does it do that? Seriously, it must be magic. Put the pen and paper down, I already pulled out all the products mentioned and put them in this handy, dandy widget for you to shop. Gosh, I'm so thoughtful.